Sunday Express Blunders Again | But what does Richard Kemp think? You’ve probably never heard of Ted Jeory – he’s a reporter for the Sunday Express. I have never bought the Sunday Express my preference has always been Andrex! Mr Jeory cannot seem to get a fact right. In his paper today he claims that I earn a six figure sum as a consultant. Mr Jeory knows that his claim for what I earn is untrue because it actually contradicts his article from the previous week which gave the totality of what I earn. In fact I earn nothing as a consultant and not six figures for everything that I earn put together. He also claims that I volunteered for an expenses paid trip to Mexico which cost almost £3,000. In fact I was asked by the British Embassy in Mexico to go to Mexico City as part of a trade delegation and my costs were only half of that. So for the instruction of Mr Jeory and to enable people to learn some wider lessons about how the Foreign Office and local government could and should work together – particularly now that LEPs are being formed I thought it might be useful to tell you what went on in Mexico and why I and an officer went. Diplomacy. In troubled times our Country needs friends. Embassies and Government talk with and to central governments; MPs and Ministers. But in many places like Mexico there is a strong system of state and municipal government which has largely been ignored. Whilst in Mexico I held talks with many councillors and signed an agreement to work together with 8 of the 30 states including Mexico City which is by far the largest. Aid. This government like the last gives aid in a variety of countries and we should be determined to see that it works properly. Often the aid is given to regional and local institutions. 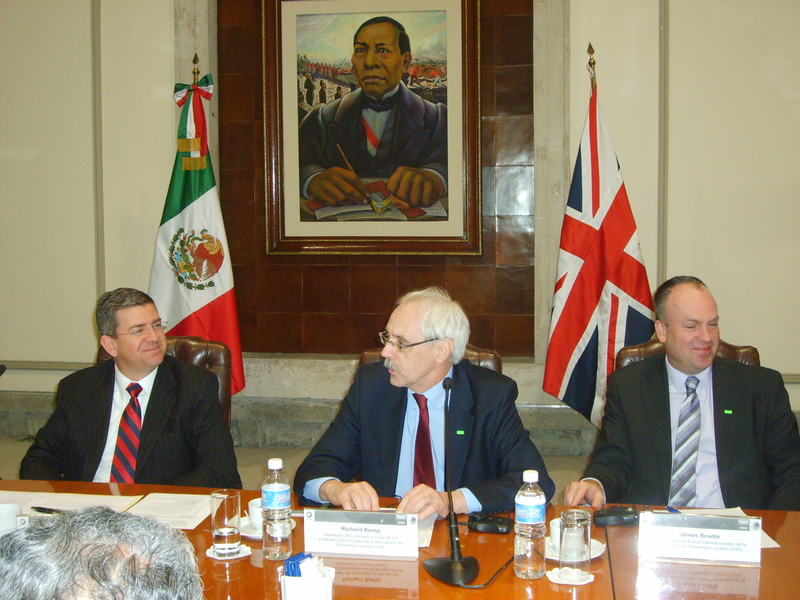 Our agreement will provide capacity building to those levels of government in Mexico. Trade. The agreement which I signed will bring a politician and officer from each of the 8 states and from 2 central Ministries to the UK in March. We have arranged a programme for them which will look at the way in which we deal with a range of issues around sustainable development. This is important for trade. States account for 70% of the infrastructure spending of the Country. Mexico is the 13th largest economy in the world. Its economy is expanding fast and is a major potential market for our goods and services yet the private sector does very little work there. By introducing people to our practices we hope to encourage them to use our private sector services and products. In addition there can be very localised opportunities which we can take advantage of by local cooperation which could not be carried forward by national bodies. In Mexico the largest chain of department stores is called Liverpool. It has 80 shops in the biggest cities of the Country. I visited them and have an in principle agreement to work with them to develop two way trade and marketing. I have no doubt that the winner from my visits to Mexico will be the Country not me. For the record I received no fee for going – gave up an entire weekend to go there as part of my visits and spent the equivalent of 2 full days travelling there and back so it was a tad knackering and had precisely 3 hours free time to enjoy the sun. If either I or local government generally was asked to go again on targeted visits like this I would strongly recommend it. We are a major trading nation. We need to be out there informing, marketing and selling our Country, its values and its opportunities. My appeal to Mr Jeory is simple. At one time the Sunday Express was noted for its patriotism. It would have welcomed the fact that people were about flying the flag and looking for friendship and trade opportunities. Now the Express is in the gutter – come on Ted you can do better than serve up half chewed and misleading facts to people. Help us fly the flag for our Country – help us win the trade that will give our people jobs.